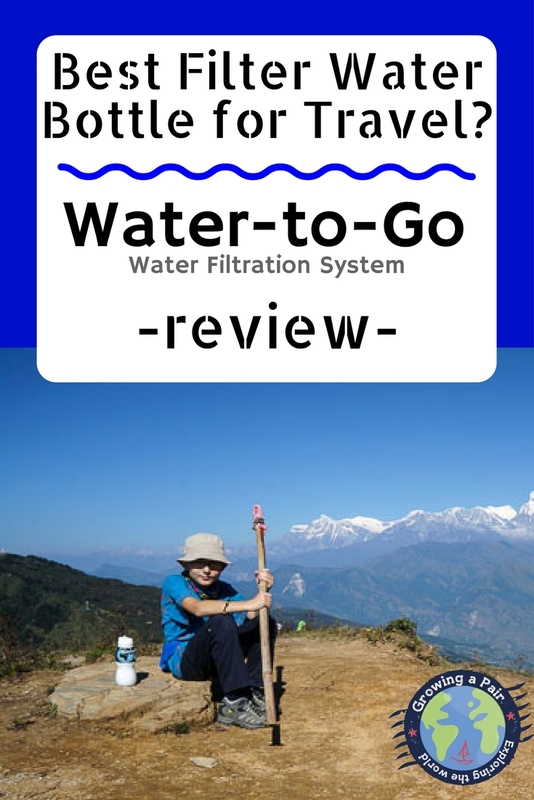 Water-to-Go Filter Bottle Review – Best Water Filter Bottle for Travel? I first saw a Water-to-Go filter bottle at the Adventure Travel Show in London a few years ago. A man was filling up a chunky black plastic bottle from a fish tank full of muddy water, and then pouring out clear water into a glass and drinking it. In fact, he was passing it round for us to drink too. Impressive, I thought. He claimed these Water-to-Go bottles had a unique water filtration system which filtered out 99.9% of the contaminants in water. “We don’t need those”, I thought, but I’d been hypnotised by his cheap selling trick, so I bought two bottles anyway. Our Water-to-Go bottles were tested thoroughly for a year while backpacking across Asia and Australia, Water-to-Go filter bottles are now an essential item for travelling. Are Water-to-Go bottles the best water filter bottles for travel? What are Water-to-Go filter bottles? How does the Water-to-Go filtration system work? How long does each filter last? What does the filtration system filter? Why you should use a Water-to-Go filter bottle when you travel? Our experiences. How we used our Water-to-Go bottles. Important instructions from Water-to-Go on how to use the bottles…. Where can I get a Water-to-Go filter bottle? Well, I wouldn’t travel overseas without one nowadays. These bottles have jumped to pretty near the top of our must have list of things to pack when we travel. We carried two in the past while we backpacked around Asia with our kids, mostly because that’s all we bought before we left home. If we’d known how much we would use them we would have bought one each. 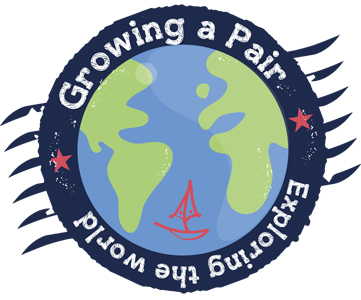 Our next adventure will be living on a sailboat and hopefully sailing around the world while exploring the countries we bump into. This is quite different to backpacking, but we will still need lots of fresh water. We’ll be taking one Water-to-Go bottle each. Our kids are big enough to carry their own stuff now and they will be getting their own Water-to-Go bottles! Right now, they are our best filter water bottles for travel. 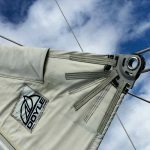 I’m hoping they will soon be our best filter water bottle for sailing too. 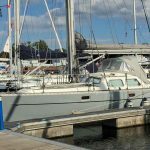 UPDATE – We are now using these on our sailing boat. 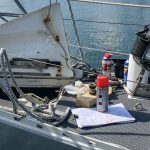 After three months sailing from the UK to the Canary Islands (over 2000 miles), I can safely say that our Water-to Go bottles were used every day. They are robust enough to not break when being thrown around in the cockpit and they take away the chlorine taste from our water tanks. Definitely a keeper for us! Water-to-Go filter bottles are sturdy, reusable BPA-free plastic bottles with a flip out spout to drink from. 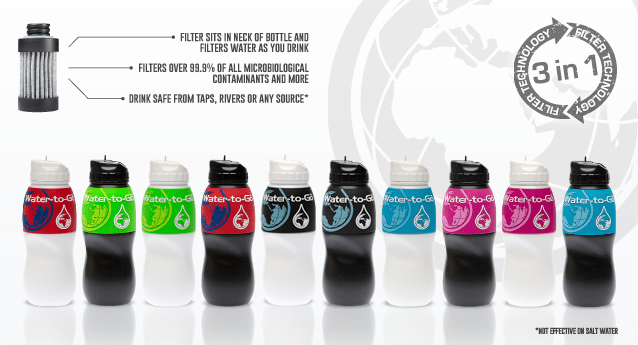 Each bottle uses a filtration system, in the form of a removable cartridge, to filter contaminants from drinking water. The bottles come in two sizes; the original 75cl water bottle and a smaller 50cl bottle which would be excellent as a sports bottle. Each size has it’s own filter. There’s a variety of funky colours to choose from. No idea. It’s something to do with NASA, nano technology and a lack of glue, or something. You can read all about it on the ‘Filter Facts’ page of the Water-to-Go website, if that’s what floats your boat. Each filter for the 75cl bottle filters 200 litres of water, which at 2 litres a day will last three months. For the 50cl Go! bottle, the filter will last two months and filter 130 litres. If you drink less water than that, or stop using the bottles for a while, you just have to keep the filter damp. Turn the bottle upside down to keep the filter activated. Throughput of water is the important factor here, not time. The filters don’t have a shelf life. You can store them for as long as you want. So you can buy the filters in bulk and activate them by soaking them in water when you need them. Now that’s more interesting, isn’t it? Water-to-Go bottles filter any non-salt water instantly. 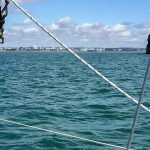 Obviously we won’t be filtering salt water while on our boat, but we can fill up from rivers, streams, marina hosepipes, taps and lakes. Any source of dodgy fresh water, in fact. It will eliminate 99.9% of microbiological contaminants, but it doesn’t like salt. Check out the whole exciting list here. Dhal baat and fresh water. As a backpacker, world traveller, hiker or or just a lover of the outdoors, you may think a water bottle isn’t a must have item. After all, you can buy bottled water everywhere, right? Well, yes, you probably can. But with the ever growing environmental impact of single use plastic bottles on our world, should you be adding to the problem? The ability to carry your own water and fill up safely anywhere is essential for the environment and for your health. Drink safe, clean water anywhere. Stay hydrated, no matter where you are. Works instantly. After you’ve activated the filter (this takes 15 minutes when you change to a new filter), you can drink straight from the bottle. No waiting around for the sterilisation tablets to work. No chlorine taste. No lumps. This one is a no-brainer. Half of the 300 million tonnes of plastic that we produce every year is for single use items, such as water bottles. You don’t need me to tell you how much damage plastic is doing to our environment, our wildlife, and us. Click on the links below for more info. Over 90% of plastic in the UK is not recycled according to this National Geographic article. 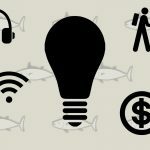 Read this article by Plastic Oceans for some scary facts. Click here to find out ways in which you can help reduce plastic waste. How much do you think it costs to buy a couple of bottles of drinking water every day for a two week holiday? Or a month trekking trip? Or a year backpacking around Asia? According to the Water-to-Go website, the cost of water through a Water-to-Go bottle is about 5p a litre, depending on which bottle you get and how many filters you buy at once. If you use our discount code at checkout, it’s even cheaper. Save money and save the planet at the same time! The first time we used these bottles with dodgy water was in our hotel in Kathmandu on the first day of our year backpacking around Asia and Australia. To be honest, I was quite apprehensive about trusting the filter with tap water that actually smelt a bit like a stagnant pond. The water came out of the spout tasting fresh and clean and none of us were ill. Thumbs up for Water-to-Go. 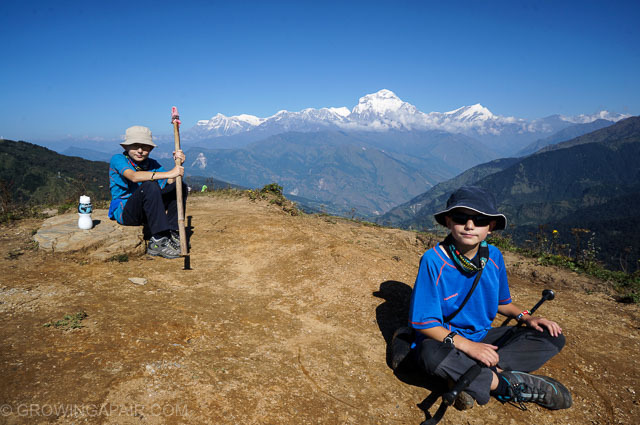 A two week trek to Annapurna Base Camp in the Himalayas in Nepal was the biggest test though. Everything you buy on the trek has to be carried up by porters or donkeys, but mostly porters. That includes all those plastic bottles of water. These amazing humans carry massive amounts of heavy stuff up stupidly steep trails, boxes and bags strapped to their backs or their heads with bits of rope. They seem happy enough as they sprint past the overweight, unfit western tourists who normally spend their day sitting behind a computer screen. I’m not taking about us here, obviously. We were like whippets. Honest. But the effort of these porters and the thought of the plastic waste left behind made me glad to have a Water-to-Go bottle. 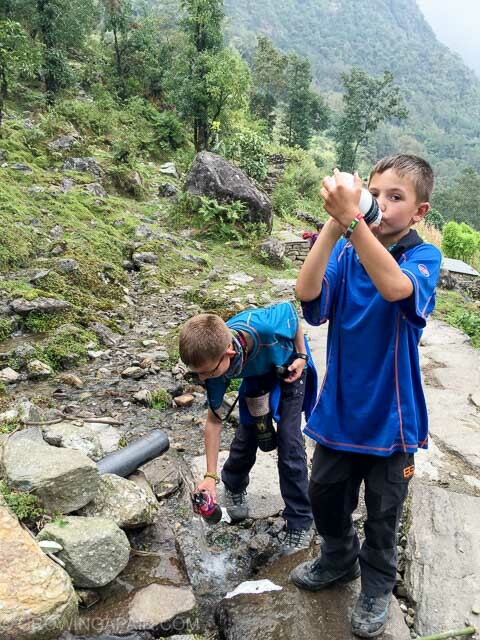 Our Water-to-Go bottles were fantastic on the two week trek to Annapurna base camp in the Nepal Himalaya. We filled up from streams, hosepipes and taps. None of that water was safe to drink without our filter bottles. 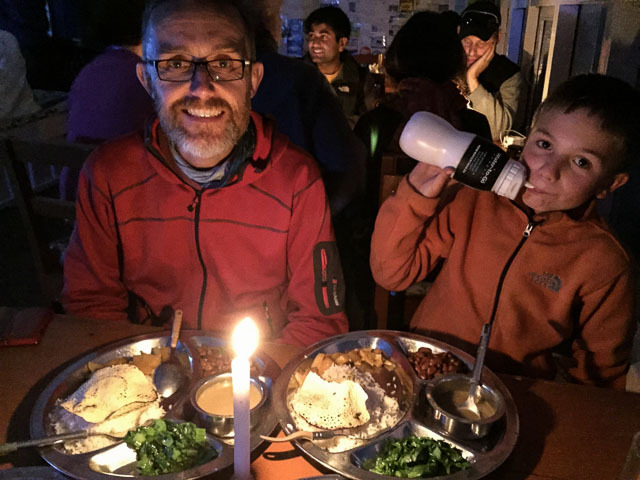 We saw other trekkers using UV sterilisation devices which seemed to take ages. We could just fill up and drink straight away. The boys (aged 8 and 10 at the time) carried our bottles in cloth water bottle carriers which we got in Thailand. That’s all they carried on the trek. They were in charge of filling up every time we passed a stream or hosepipe, and they could drink whenever they wanted. No need to ration the water supply. In every country we visited, we used our bottles. We used them in hostels and hotels, not only to drink from but also for teeth cleaning. 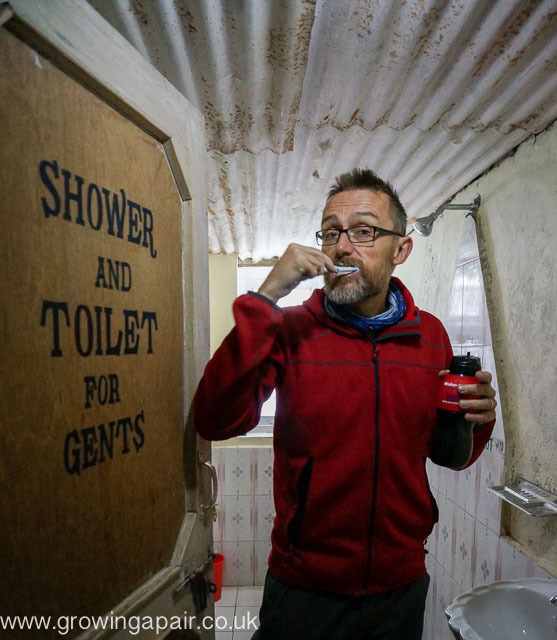 We didn’t get ill while we were trekking for the two weeks in Nepal, and that was the most extreme use of the bottles in our year away. In fact, the only dodgy tummy issue we had was Dez just once in Sri Lanka. There’s no way of knowing where you pick a tummy bug up from, so good hygiene is essential all the time when you are travelling. Wash your hands! A dodgy hostel somewhere in Asia. We can think of only two possible disadvantages to these filter bottles. You have to drink through the spout which doesn’t have a particularly high flow rate (for obvious reasons, there are a lot of beasties to filter). It’s a bit like drinking from a straw or one of those sports water bottles. We didn’t have a problem with this but others might. 2. The water is at ambient temperature. To make these bottles even better, we would recommend that Water-to-Go fit an ickle tiny refrigeration unit to the bottom of each bottle. :o) Then we could have ice cold, filtered water anywhere we went. Think about it, Water-to-Go! “The filter MUST be wet thoroughly to activate the technology; drinking before the filter is wet through can lead to unfiltered water passing through the membrane. We suggest the first time you use a new filter you fill the bottle up and turn it upside down, submerging the filter for a minimum of 15 minutes. After soaking, open the spout and squeeze the bottle gently, releasing the water, and thereby ‘flushing’ the filter. Some granules of carbon may be visible, simply continue until water runs clear. Please note that the carbon granules are not harmful. If the filter has stood for a period of time and become dry, reactivate in the same way. Ensure lid and filter are properly tightened to ensure a good seal but do not over-tighten. Do not let contaminated water come into contact with the outer lid or spout; No matter how good Water-to-Go filters are, they can only filter what is inside the bottle. Our bottles deliver a drinking rate of 10-12 mls per second; a good guzzle rate! The filter controls the flow rate. Do not squeeze the bottle hard, as this can create high pressure behind the filter and, in extreme cases, can pressurise the lid forcing a gap between the bottle and lid, and possibly allowing water to bypass the filter. Change the filter after 3 months or approximately 200 litres, for a 75cls size, or 2 months and 130 litres for the GO! bottle filters. Clean your lid and spout regularly (handwash only). PLEASE NOTE; the GO! bottles are NOT dishwasher safe, unlike the 75 cls. Always clean lid and spout by hand. Also, DON’T use Water-to-Go filter bottles for SALT WATER (sea water). DON’T use Water-to-Go bottles for drinking URINE, although I’m tempted to try. I’ve never tasted my own wee. ONLY use Water-to-Go bottles for water, not other liquids. You could clog up the filter. Bottles are sold all over the UK and Europe. The list of worldwide distributors is growing too. You can buy directly from the Water-to-Go website in the UK. Click here to find the Water-to-Go website. Get a 15% discount off any filtration bottle or filter by using our Water-to-Go discount code. Enter the code GAP15 at checkout and get a massive 15% off. You’re welcome! Water-to-Go bottles and filters are sold in the UK in outdoor stores (Blacks, Rohan and Millets should have them on the shelves) and also in Boots stores. Click here to find a list of stockists. You can also find the bottles and all the accessories on Amazon.co.uk (not yet available on Amazon.com though). Note – There are reviews on the Amazon website complaining of the bottles leaking. I have never had this problem, but just in case, try and keep the bottles upright. So there you have it! That’s our opinion on the Water-to-Go filter bottle. I’m going to use my favourite phrase again though….. Opinions are like arseholes. Everybody has one. No water filtration bottle is perfect but these are the closest we’ve found. We would recommend a Water-to-Go filter bottle for travelling, camping, trekking, hiking, sailing, or sports. We love ’em! Pin this in Pinterest for later…. Disclaimer : Water-to-Go didn’t pay us for this review. We’ve been using their bottles for two years now. We haven’t received any free products (although I’m hoping they may send me a replacement for the bottle I lost on a train somewhere in Asia). If you use the discount code GAP15 to buy from their website, you get 15% off and we get a small commission. These opinions are our own. We will never, ever recommend a product that we don’t use, love or really, really want. Fantastic. I think I know what we all need for Christmas now! Going to click link and see what colours they come in. There’s 6 of we’re going to need different ones if possible. Would love to see a close up photo of your water bottle carriers? We were only in Chiang Mai for 4 days and don’t remember spotting them in the markets? Hey, Samantha. We actually got our water bottle carriers from the Elephant Nature Park outside Chiang Mai, but I definitely saw similar things in Thailand. Or was it Vietnam? Hmmmm…. I’ll add a photo to the post. My family has one of each water-to-go filter bottle. It is very great for travelling and for everyday use. I am going to buy another of these as a gift for my sister. I think that she’ll gonna love these too. I’m off to Everest in may 2019 and I have a water to go bottle and I’m wondering did u have to put chlorine tabs in the bottles to be sure it was clean water you were drinking or are the filters reliable enough to trust without using any chemicals thanks dave. Hi David! Sorry for the delay in replying – just managed to get access to internet after a month crossing the Atlantic. In Nepal, and everywhere else, we don’t add anything to the water in our water-to-go bottles. The filters use three methods of filtration and that’s all you need to remove 99.9% of beasties and contaminates. 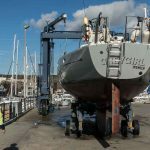 The filter removes chlorine too, so gets rid of most of the taste of chlorinated water, which has been fab which our fresh water tanks on our boat. The water from the tap normally tastes like swimming pool water! If you have any doubts at all please contact Water-to-Go. They are very helpful and obviously I only have my experiences to go on – they’ll know much more. But basically, we used the bottles everywhere and didn’t get ill. We love them.